Whether it is honest perceptions or media manipulation of public opinion driving the debate, incidents involving police and black men are occurring and the tension between these two groups is very real. But, there is a common truth that may help us gain perspective and understanding: each individual's truth. 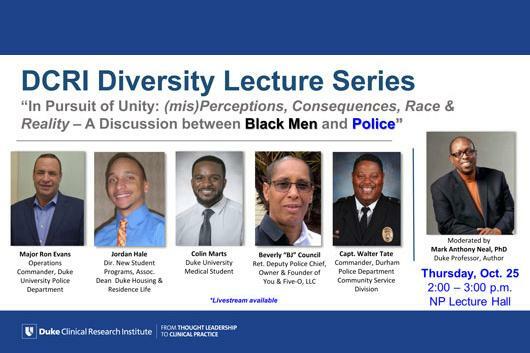 Panelists from the community, Duke University, and both the Duke and Durham Police Department will share their insight, experiences, and opinions as they engage in frank dialogue that seeks commonalities and offers possible solutions for (re)building trust and improving relations between the black men and law enforcement. *This program is scheduled to overlap with the release of the film, "The Hate U Give," based on the award-winning, NY Times bestseller of the same name.